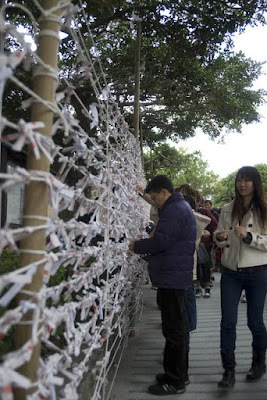 It is a tradition in Japan to buy a fortune at New Years and then tie it to a string at a shrine. The fortunes (called Omikuji) usually give advice for various things, such as how the next year will be, when's a good time to travel, romance prospects, etc. - the usual fortunate-type stuff. You don't know what your fortune will be when you buy it - it could be good or mediocre. I don't know if they give out "bad" fortunes. I decided to remain in the dark about my fortune and didn't buy one. 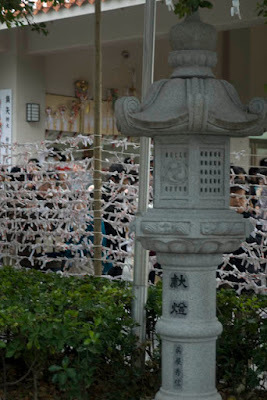 The above picture is a snapshot I took of some of the fortunes tied at Naminoe Shrine. Pictured below is another view of the fence of fortunes.